Hi Connie here with you today with 3 cards using the same main die. I am starting with the card with the most detail and working my way down to ones that are a little less time consuming, depending on the time you have to make them. 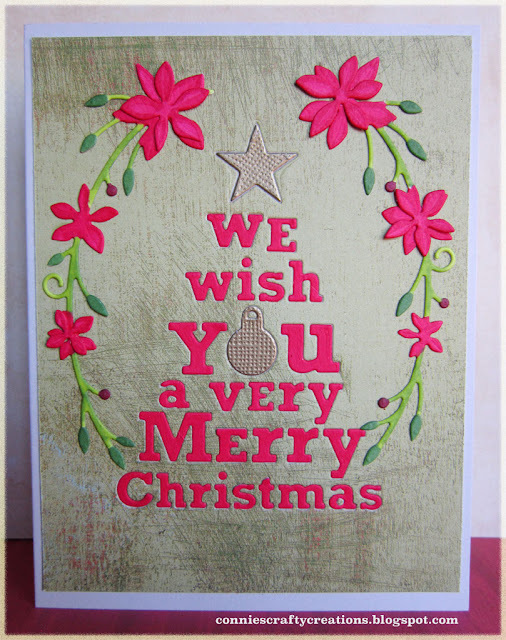 The main die I have used in all of these cards is the Poppystamps We wish you a merry Christmas die. I first cut the die out of my Basic Grey paper and then added some double stick tape to the openings on the back of the paper so when I cut the die once again out of red cardstock, I could just pick them up and set them into the blank spaces and they would stick, quicker than gluing. I also cut just the star and ornament out of silver paper. I also paired it up with the Memory Box Seraphine Laurel die you might remember I used this die here back in August and mentioned I could use this die for all sorts of occasions and I think it frames this die very well. I colored it with markers. 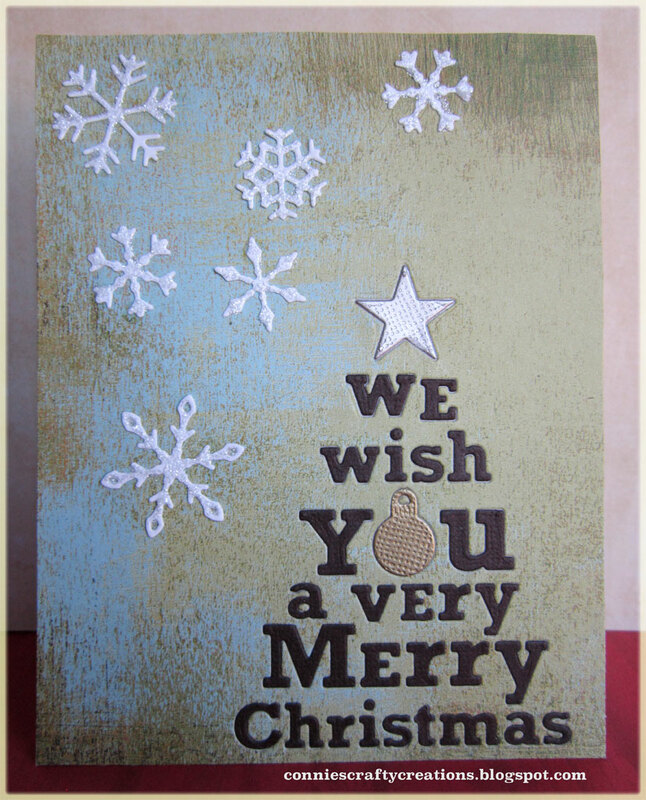 On my second card I die cut it at the bottom right corner and inlaid it with brown cardstock, the star in silver and ornament in gold papers. 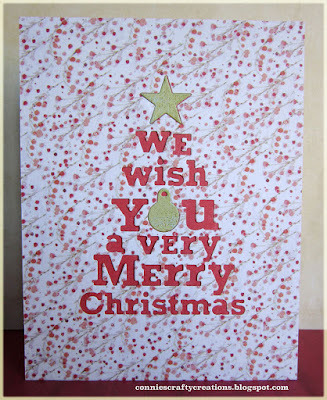 I also used Poppystamps Valley snowflakes. The store no longer carries these dies but you can find many snowflakes to chose from Here . 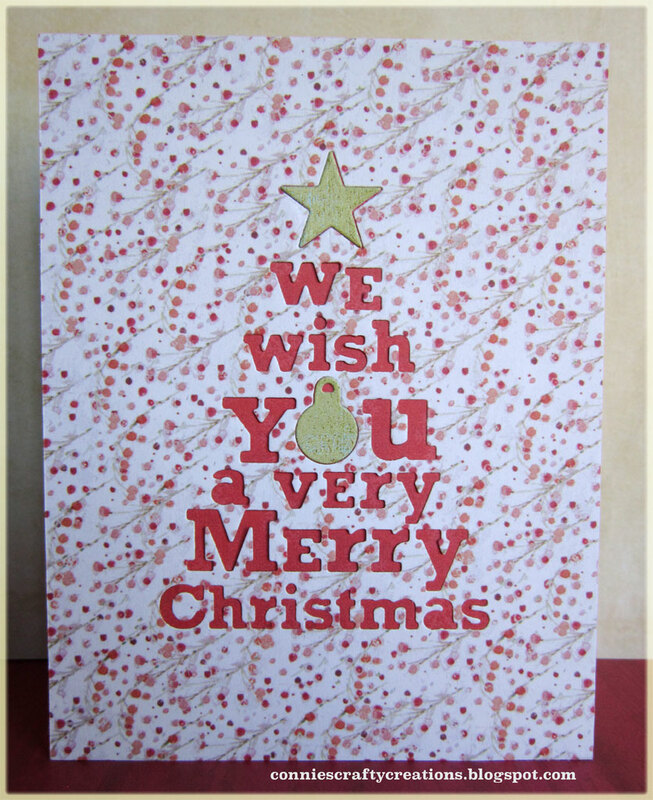 To give it an extra bit of sparkle I added Frosted Lace Stickles to the snowflakes. This last one took the least amount of time to make of all of them, just took some paper, cut the die and added a piece of red paper behind the die opening, only inlaid on it are the star and ornament. These are all very flat so the mailing would be kept down to a single stamp, I hope you found one option that will work for you. Here are the dies I used with the links above. I love your three cards Connie, the first being my absolute favourite! ;-) What a fabulous sentiment die, I have missed seeing that one! The laurel die frames it beautifully. I really like the inlaid technique too. Thank you for such great inspiration! A lot of work went into making these cards as is obvious by looking at all the detail on them. Very pretty work. These are FABULOUS Connie! Thanks so much for the wonderful holiday card inspiration! Awesome cards Connie! I love that poinsettia die. These are all so pretty! The laurel die really is so lovely. You've shown wonderful versatility using it too. A great post!! So pretty! I love how you inlaid the dies...such a fun look!! such a fantastic job on the inlaid dies! I know how intricate that can be!